No existential problem for life on earth is perhaps as mundane as water. Without it, there would be no life. Yet, as the world’s population keeps rising, the overabundance or scarcity of water, and its suitability for consumption and for agricultural and industrial uses amid widespread pollution in many countries, pose some of the most vexing challenges to policy-makers. Add the fact that climate change is altering the meteorological algorithm that distributes water around the globe, and it becomes clear that many of the struggles that will bring nations into concert or conflict in the years ahead will involve water. The situation is particularly acute in Asia. The region, which enjoys the most dynamic growth of any in the world — and the associated demands on the supply and quality of water — is home to 60 percent of the world’s population, but has only 36 percent of its water resources. That stark imbalance is sobering. If Asia is to prosper in an atmosphere of peaceful relations among nations in the region, then greater co-operation on water issues will be critical. Also, the exchange of ideas about how best to tackle water-related problems will play a vital role in addressing these problems, since the lessons learned in one country may well apply to another, despite the many differences in the water issues each Asian country faces. 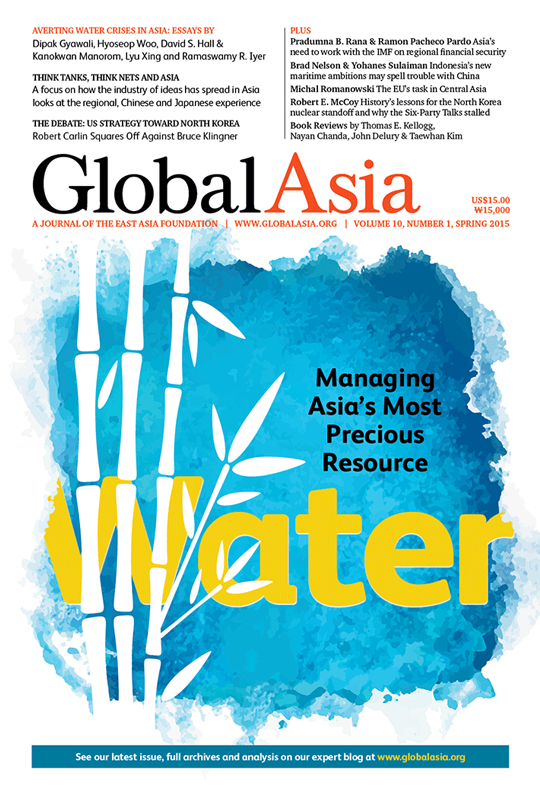 In that context, the cover package of the latest issue of Global Asia, guest edited by Dipak Gyawali, comes ahead of the 7th World Water Forum, to be held in South Korea in April. There, many of the world’s water specialists will gather to take stock of global efforts to address the myriad challenges associated with water. Elsewhere in this edition of Global Asia, our features section includes an assessment of Indonesian President Joko Widodo’s surprise announcement shortly after taking office last year that he plans to double or triple the country’s defense spending, in an effort to make the country a major regional maritime power. We also look at why different perspectives on history among the parties to the Six Party Talks are hampering a solution to the North Korean nuclear issue, and how the European Union is attempting to re-engage with Central Asia as a new player in a version of the old Great Game. We round out our features section with an argument for greater co-operation between ASEAN+3 and the International Monetary Fund. Our Debate section pits two different views against each other on how, and whether, the US should engage North Korea, while our In Focus section looks at the rise of Asian think tanks in the context of what is happening in this area of policy-making analysis elsewhere in the world, with particular emphasis on China and Japan. 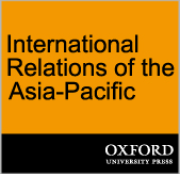 Our Book Review section highlights a series of volumes that situate Asia’s long history of engagement with the rest of the world in the context of globalization, well before “globalization” became incorrectly associated with the modern world. Finally, we review a seminal work by one of the earliest advocates of engagement with China that argues it might have been a mistake to embrace China in the way the West did. Asia’s water problems are particularly acute. The region is home to 60 percent of the world’s population but has only 36 percent of global water resources. That stark imbalance is sobering. If Asia is to continue to prosper and do so in an atmosphere of peaceful relations among nations, then greater co-operation on water issues will be critical. 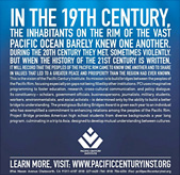 Asia has a long history of viewing water as both sacred and wicked. That profound dichotomy persists in current strategies to cope with an emerging water crisis in the region. Asia faces water conflicts, natural disasters and rapid urbanization. The 7th World Water Forum in April aims to find solutions. China’s vast size, population and shared resources with other countries mean its water policies are increasingly a subject of regional interest and concern. The waters of the Mekong River are contested by advocates of hydropower and the millions who need its water to live. Can the two be reconciled? India must foster honest engagement to resolve water tensions that have either been or are becoming key areas of dispute with its neighbors to the north. There are precedents for reading Pyongyang’s offers to restart talks, but the US has not properly read the signals this time. The US should beware North Korean offers to resume nuclear negotiations as its concessions are empty. What to do about North Korea? Start by looking at the different historical perspectives of the Six-Party Talks participants to explain halting progress. It’s time for regional financial security initiatives to co-operate more closely with the IMF. Indonesia’s newfound ambitions to rule the waves could put the country on a collision course with China in the South China Sea. Resource-rich and growing in importance, Central Asia can’t be ignored, but the EU must rethink its engagement to be more effective. Think tanks have a complex taxonomy, reflecting their myriad forms. Asia has begun to make distinct contributions. Chinese think tanks are still associated with government. But independent think tank numbers are growing. Japan is losing out in the global contest for ideas and influence for lack of a vibrant think tank culture. Alternative Asian histories explored in two volumes of Asia Inside Out, edited by Eric Tagliacozzo, Helen F. Siu and Peter C. Perdue, and Asian Encounters: Exploring Connected Histories, edited by Upinder Singh and Parul Pandya Dhar. A startling thesis on China’s rise in The Hundred-Year Marathon: China’s Secret Strategy to Replace America as the Global Superpower, by Michael Pillsbury. 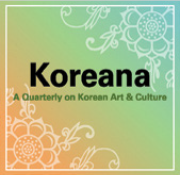 Recent titles by Daniel Tudor and James Pearson; Michael Meyer; Jong-sung You; Andrew Small; Mariya Y. Omelicheva (ed. ); Karen Dawisha; and Xi Jinping. Plus a video documentary by Chai Jing.